Meeresbande - ZineWiki - the history and culture of zines, independent media and the small press. Meeresbande (German for Sea Crew) or Meeresbande-Zine is a perzine from Meeresbande and is about their life with Dissociative Identity (Dis)order (formerly known as multiple personalities). The texts are written, collages created and pictures drawn by different system mates ("personalities") in German or English language. 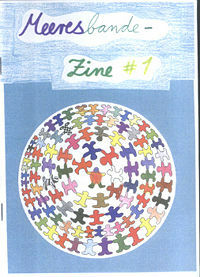 The first issue was released in April 2009 (in time for the Zinefest Mülheim) and consists of 32 pages. They made a coloured cover but the rest is b/w. Until Oktober 2016, the "collective" released four issues of Meeresbande. The first three publications are included in the collection of the St. Patrick's Zine Library. All Meeresbande Zines and several smaller Zines by Meeresbande are available at their blog (see Link below) for free download. This page was last modified on 19 September 2017, at 08:02.